It's that time of the year everyone! Cold and flu season is fast upon us already. I will be talking at Mama Needs a Drink LA and help you break down the 4 different types of Colds/Flus and Coughs that we Physicians of Oriental Medicine recognize. Knowing the signs and symptoms of the these different types will help you properly assess what your child (or yourself!) is catching and administer natural home-remedies and massages to nip it at the bud. Consider yourself the first line of defense in medical care armed by this information before having to rush to the pediatrician's office! 9/21/15: If you would still like to sign up, you will be placed on a wait list at this point. We will contact you if anyone registered cancels, or if we decide to move this class to a bigger venue to meet the demands of the community. School is back on and I bet you are already stressed out. I've noticed in my clinic that the kids who were doing well, relaxed and happy during the summer break, are coming into my clinic stressed, having tummy issues, sleep issues, emotional issues. All from just going back to school. Some are already getting sick. What to do, what to do? Wellness mom-experts Tracey, Christie and I to the rescue! Bring your children to learn from the three of us how to meditate, be mindful, eat right and do some yoga moves so that they can learn self-awareness and self-regulation techniques to help them manage the stresses that come with going back to school. A healthy group of children makes for a healthy community and we want Westchester to be a strong, healthy, happy community! Luriko Ozeki, L.Ac., Physician of Oriental Medicine and Pediatric Specialist, will teach your kids the meaning of Eating Right and Eating Healthy and tips on how to stay healthy and cold/flu free. Tracey Lenac, MAEd, founder of Soul Centered Kids, will teach your children how to practice mindfulness and child-appropriate meditation techniques to help them cope with modern day stresses of being a child. Christie Savitt, MA, founder of Blue Bird Behavior Resources, will teach children special yoga moves to help them get out of their heads and into their bodies, allowing them to be more present in the moment. RSVP: Fill out the form below. Please provide us with the name and ages of the children attending when RSVPing. Space is limited, so RSVP is a must. Super Mom: Eating Better + Loving You! Tues 8/4 - Mon. 8/24/15. Normal business hours will resume Tues. 8/25/15. If you need to reach us, feel free to contact us but please note Luriko will not be checking her phone/email regularly as she will be out of the country. For all medical emergencies, please call 911. To set up an appointment, please use the "Book an Appointment" option at the top of the homepage. Happy and Safe Summer everybody! Ever wondered if what you're feeding your child is good--and good enough? Do you know if you child is getting adequate nutrients through his/her food? This is a parent-ed class for parents who want to incorporate nutrition as an avenue to help optimize their child's mind, body and spirit. Luriko Ozeki, L.Ac. (and mom) will answer many questions you've probably had about nutrition for your family. The importance of nutrient-dense food, and why this frees you from calorie counting. The ideal amount and type of protein, sugars, carbs, and veggies to feed your child, based on age. How to shop the markets that guarantees optimal, nutrient-dense meals for the whole family. Specific dietary needs for your vegan/vegetarian child. How to pack a healthy lunch and snacks for your school-age child. Strategies to get your child to be less picky and to eat in general. Why your child may be picky or have food sensitivities/allergies, and what to do about it. As a contribution to their fundraising efforts, Luriko will donate 100% of funds raised to the school. I will be speaking about this hot topic at Outstanding Mother's Gathering on Tues., March 31st at noon. I will cover how modern-day nutrition -- with its highly processed, corporate-profit driven nutrition standards -- can cause or exacerbate these Contemporary Chronic Childhood maladies, or the 3Cs. I will in turn teach you how Real Food Nutrition can be a powerful tool to use to heal the 3Cs and how to start transitioning into a real food family. $20 per person. RSVP required. Please click here to RSVP. Thank you. 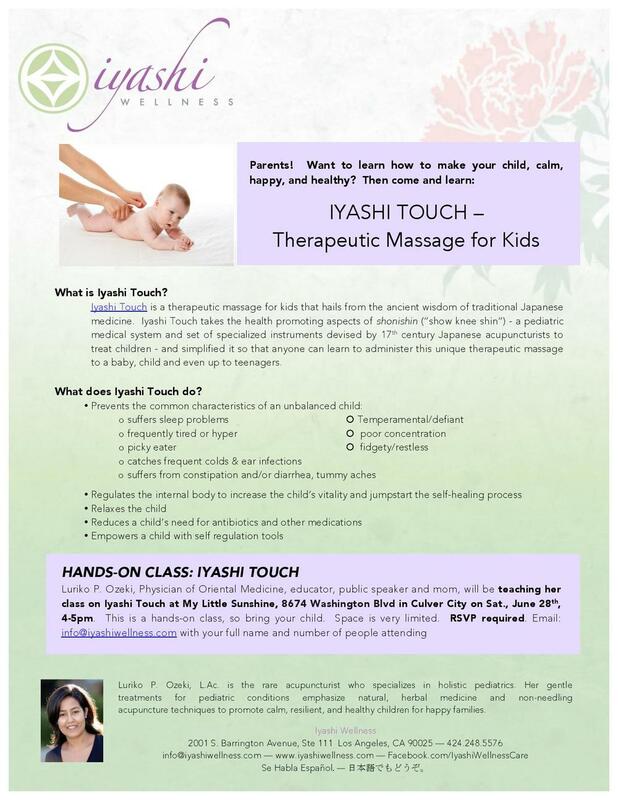 I will be speaking about this hot topic at the Integrative Pediatric Wellness Center on Sat. 1/24 at 3pm. $20 per person if registered by 1/18. $25 per person after 1/19 and at the door. The office will be closed Wed 11/26- Sun 12/30 in celebration of Thanksgiving. Happy and safe Thanksgiving everybody! The office will be closed 11/6-11/10. I will be attending a pediatric seminar and will not be checking emails or returning phone calls until Tuesday 11/11. Thank you for your understanding. Time to buckle down and help our kids thrive back in school! One of the most supportive ways to do that is through the food our kiddos eat. Come to my very informative talk in September, at two locations, so that you can learn how to help your child flourish in all aspects of his/her life. Seating is very limited, so registration is required. Please go here to register for the 9/20 talk. The office will be closed Friday, August 1 - Tuesday, August 5th morning for summer vacation. Thank you. The office will be closed from Saturday, Feb 15th - Saturday, Feb 22nd. Normal business hours will resume Monday, Feb 24th. All phone calls and emails will be replied upon my return on Mon., 2/24.